The Missouri Bicycle & Pedestrian Federation is in Washington DC this week, along with several other Missouri bicycle & pedestrian advocacy groups, at the National Bike Summit. After three days of conference sessions and meetings, we'll spend Tuesday and Wednesday on Capitol Hill, meeting with every Missouri House and Senate office. What are we asking for in 2019? The 2019 Missouri Active Transportation Summit is Friday, August 9th, 2019 in Columbia. Would you like to tell the story of your bicycle, pedestrian, or trails program, project, or success? Or present on any topic related to bicycling, walking, or trails in Missouri? The Summit is soliciting session proposals through midnight on Sunday, May 12th, 2019. Your community has some amazing bicycle, pedestrian, and trails projects it wants to build--perhaps even a local or regional bicycle, pedestrian, or trails plan. But now you need the funding to actually build. Build a community partnership in support of these projects. We have a whole page with ideas to help your community take these initial steps. Then you are ready to approach potential funders to take the next steps. A bill prohibiting all Missouri drivers from texting while driving and requiring hands-free use of electronic devices while driving has been introduced by Senator Wayne Wallingford (R-Cape Girardeau). The bill, SB 15, was heard in the Senate Transportation Committee last Thursday and the Missouri Bicycle & Pedestrian Federation was there to testify in support. Our members have consistently identified legislation dealing with distracted driving as one of their top legislative priorities. Also testifying in support of SB 15 the yearing were about thirteen other supporters, including the American Automobile Association, Associated General Contractors, the medical/health organizations, insurance companies, telecommunications companies, and others. MoDOT, which has been working with legislators on this issue for years, has compiled some compelling statistics and data on the issue, including some showing the overall effectiveness of this type of legislation in improving safety. This year, the Missouri Bicycle and Pedestrian Federation has helped lead the national charge for better regulation of self-driving vehicles--self driving systems that far too often do not provide nearly enough safety for people who walk and bicycle. We are very happy to report that a last-minute push to pass the AV START Act, a low-oversight, corporate-friendly approach to allow the national rollout of extensive driverless vehicle testing on public streets, has failed in Congress. Pat Jones, long-time support of trails, parks, and conservation in Missouri, who with her husband Ted Jones was the driving force and major private donor behind the creation of the Katy Trail, passed away at her home in Williamsburg Monday. A memorial service is planned later in the spring. Pat was a long-time MoBikeFed Yellow Jersey Club member and one of the most generous supporters of MoBikeFed--and many other Missouri trails, parks, and conservation-related groups--over the years. Please help preserve Missouri's next major cross-state rail trail for the future! Missouri's general elections are being held across the state on Tuesday, November 6th, 2016. So whatever your party, whoever your candidates, whatever your issues, please get out and VOTE on Tuesday, November 6th. Prop D, Missouri fuel tax proposal on Nov 6 ballot: What is it? What does it do for bicycling and walking? One of the major issues on the November 6th election ballot is Proposition D, a proposal to raise Missouri's fuel tax by 10 cents per gallon over a four-year period. Some of the most common questions we are getting now are: What does Prop D do for people who walk, bicycle, and use trails? Where does the money actually go? Should I consider supporting it? Missouri State Parks has announced three public meetings the last week of October at towns along the Rock Island Trail Corridor. An alert released this week by the Missouri Parks Association indicates that attendance at these meetings by supporters and the quality and quantity of the written comments submitted by supporters may well be the crucial deciding factor in State Parks' decision whether or not to accept the corridor. Please plan to attend one of these important upcoming meetings about the future of the remaining 144 miles of the potential cross-state Rock Island Trail between Windsor and Washington. 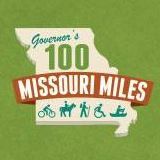 After a long process of investigation and public comment, Missouri State Parks has scheduled three meetings to present their conclusions about developing the remaining 144 miles of the Rock Island railroad corridor into a long-distance recreational trail, becoming Missouri's second cross-state trail. The trail is a tremendous opportunity for sustainable, long-term economic development for dozens of communities along the corridor that have been left behind since the closure of the Rock Island railroad in the early 1980s. Will Missouri seize the opportunity to create another internationally significant trail and tourism destination, or not?